I've started a new Spirit Book. The design of the pages is inspired by the approaching season in the Celtic calendar—spring—and the custom of making and hanging a St. Bridget's cross on the door for twelve month's luck. I've always been interested in folk customs, particularly those that connect with the season and form a bridge between the outside world and the one within our homes. I think there is a link between that interest and the Spirit Books. Here are some of the miniature St. Bridget's crosses I've made for the pages of the book. It's a simplified version made with paper. Traditional ones are made from rushes. I think I have mentioned how faulty my math can be. I am planning for 6 sections in the book with 8 pages in each. My first round of math led me to say that I needed to make 48 crosses. For some strange reason, I decided that was wrong and redid the math to come up with the number 256 (24 x 8) for who knows what reason. Thankfully I realized my original calculation was correct before I continued on past 48. 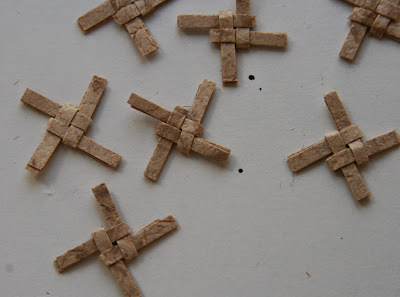 Upcoming posts this week will feature progress on the book and directions for how to make your own simplified St. Bridget's cross out of paper. I can't tell you how reassuring it is to hear that you also have problems with numbers! My first answer is usually the correct one, as was yours, but my belief that I'm numerically challenged makes me try various methods, none of which are right and all make me more muddled. Love the little crosses! Carol And I too am glad to have company!